It’s that time of year again, where we call on the people of Greater Manchester to take a few minutes out of their busy day to have a think about who they would like to nominate for the Cream of the Community award scheme. Whether it is a family member who fills their week helping their nearest and dearest, a friend that has gone the extra mile to raise money for charity or a colleague that has added volunteering to their do list – we want to hear all about it! Recognising the outstanding contribution people make in the areas that Creamline Dairies serve on a daily basis, the Cream of the Community award scheme is open to all individuals, with last year’s star fundraiser Ethan Evans crowned winner of the award. The winner of this year’s Cream of the Community Award will be treated to a three month supply of Creamline’s exciting new offering – a local market fresh fruit and veg delivery service, along with a £500 donation to the charity of their choice. The person who nominates the Cream of the Community winner will also be treated to a three month supply of Creamline’s fruit & veg box. 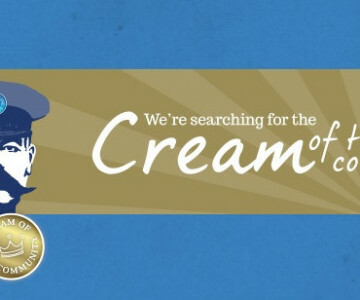 Closing date for Creamline’s Cream of the community award scheme nominations is the 31st January 2016 – so get your nomination in early, so we can hear more about your unsung hero!